In this scenario, you will understand Kubernetes and orchestrator. In Docker 101 - Introduction Overview for Beginners, we focus on Docker and Container. In the production environment, handling the container by hand is not a good solution. Orchestrators are systems that reflect a declarative state in the environment and try to always have the right state. 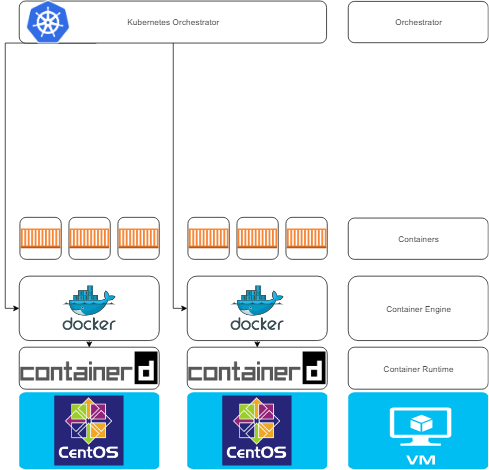 There is multiple containers orchestrators like Docker Swarm, Kubernetes, Mesos/Marathon, ... but we focus on Kubernetes. Master components provide the cluster’s control plane. Master components make global decisions about the cluster (for example, scheduling), and detecting and responding to cluster events (starting up a new pod when a replication controller’s ‘replicas’ field is unsatisfied). Master components can be run on any machine in the cluster. However, for simplicity, set up scripts typically start all master components on the same machine, and do not run user containers on this machine. Component on the master that exposes the Kubernetes API. It is the front-end for the Kubernetes control plane. It is designed to scale horizontally – that is, it scales by deploying more instances. Consistent and highly-available key value store used as Kubernetes’ backing store for all cluster data. Always have a backup plan for etcd’s data for your Kubernetes cluster. Component on the master that watches newly created pods that have no node assigned, and selects a node for them to run on. Factors taken into account for scheduling decisions include individual and collective resource requirements, hardware/software/policy constraints, affinity and anti-affinity specifications, data locality, inter-workload interference and deadlines. Component on the master that runs controllers . Logically, each controller is a separate process, but to reduce complexity, they are all compiled into a single binary and run in a single process. Node Controller: Responsible for noticing and responding when nodes go down. Replication Controller: Responsible for maintaining the correct number of pods for every replication controller object in the system. Endpoints Controller: Populates the Endpoints object (that is, joins Services & Pods). Service Account & Token Controllers: Create default accounts and API access tokens for new namespaces. Node components run on every node, maintaining running pods and providing the Kubernetes runtime environment. kubelet An agent that runs on each node in the cluster. It makes sure that containers are running in a pod. The kubelet takes a set of PodSpecs that are provided through various mechanisms and ensures that the containers described in those PodSpecs are running and healthy. The kubelet doesn’t manage containers which were not created by Kubernetes. 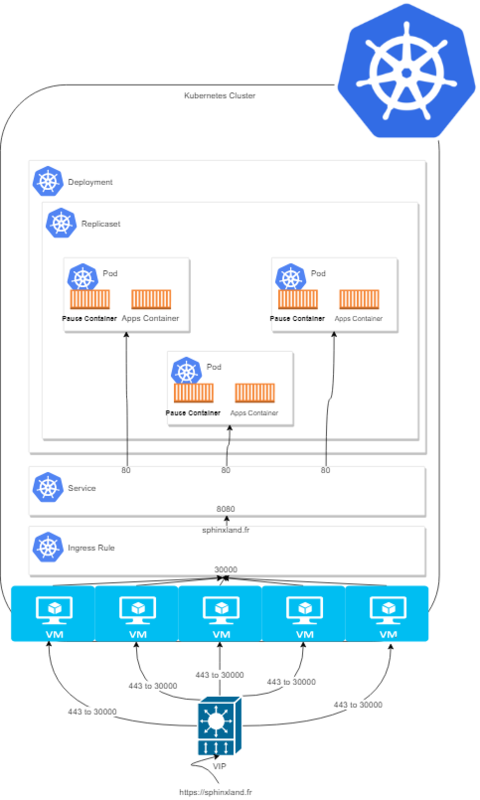 kube-proxy kube-proxy enables the Kubernetes service abstraction by maintaining network rules on the host and performing connection forwarding. Container Runtime The container runtime is the software that is responsible for running containers. Kubernetes supports several runtimes: Docker, containerd, cri-o, rktlet and any implementation of the Kubernetes CRI (Container Runtime Interface). Components are systems services or containers that provide the cluster’s control and data plane. Objects are declarations stored in etcd to defined apps and other process to obtain cluster&apos;s functional services. Pod : Minimal object in cluster. It&apos;s a set of 1 ort more containers excluding pause container which support network. Replicaset : Number of replicas (pods) that app needs. Service : A Kubernetes Service is an abstraction which defines a logical set of Pods and a policy by which to access them. Ingress Rule : Ingress, added in Kubernetes v1.1, exposes HTTP and HTTPS routes from outside the cluster to services within the cluster. Traffic routing is controlled by rules defined on the Ingress resource. Kubernetes is composed of many objects that make its learning curve difficult however the following list represents the first above objects needed to survive in this eco-system. Namespace : Pseudo Environment can be defined as private collection of objects. All objects in this env are not visible from other namespace. All apps could be resolved with short name. NetworkPolicies (optionnal) : Kubernetes Network Plugin firewall rules. Here, you will find some basics command.